Motorcars recommends three different oil change intervals based on your vehicle and the type of oil required by the manufacturer. If your car uses standard oil the interval should be 3000 miles. You may choose to use a semi-synthetic where the interval could be 5000 miles. If your car requires full synthetic oil the interval should be 7500 miles except VW 1.8 turbo which should be 5000 miles. Newer cars have on-board oil change and service monitors that may allow 12000 to 15000 miles before an oil change is required for most driving conditions this is too long. Since the average driver puts 12000 to 14000 miles per year on their car this means the vehicle would not be inspected for more than a year. Not having fluids, belts and tires checked for more than a year could lead to unexpected problems. Motorcars International’s experienced technicians provide a vehicle check with each oil change to keep you from having unexpected problems. The type of oil required depends on the age, model, local climate, engine as well as the transmission type of your BMW. 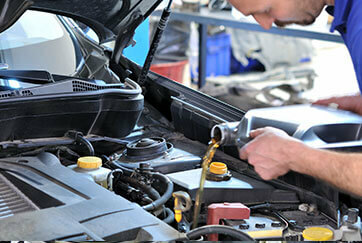 The Oil Change Mechanics at Motorcars International in Atlanta go above and beyond the call of a standard oil change. Their passion for your BMW’s function is mirrored in their customer service. So come by today and let our BMW Oil Change Mechanics fit your car with the best oil on the market. We look forward to serving you soon!